If you did not get one for christmas maybe you were like me, clueless. Yet, it took me only days after xmas to know, I want an Amazon Kindle. Sooner than one can think, Valentine's Day. ... And I've made mention to significant others. LOL! A visit to probably Vermont's only BEST BUY and this article "Kindle vs. Nook vs. iPad vs. Galaxy Tab: What To Consider - A Breakdown of the Most Popular Ebooks and How They Work," has made me certain that I want a Kindle. I READ. During 2004, I read at least 50 bestsellers on the NY Times BestSellers list. In 2010, I returned to my old South Florida Library to get a record of the books I had loaned back then. Only to be told my record was no longer on file, since I was such a good loaner of books. I had no outstanding books or lost books so my record had been disposed of. I was so disappointed. Also when I travel, it would be nice to get rid of the book weight. So to store all my books in a device. Priceless. And the Kindle is affordable $139 to $189. 'Though I love MAC. I have used Mac computers from childhood. Apple II E, anyone? LOL! Anyway, the next 2 Mac products I'd consider buying are the Mac Book Air and iPhone. I really don't have my eyes on the iPad ... even if its pages curl like they do in a real book. 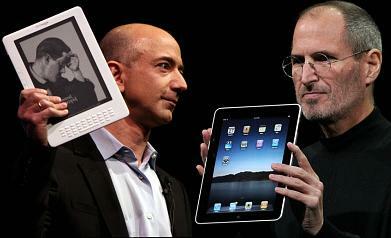 And to spend anywhere between $499 to $899 on an iPad, just give me the Kindle. Then there's the Barnes & Noble Nook Color which like the iPad provides color screens but I prefer the lighter weight Amazon Kindle over the Nook, despite Kindle's grayscale E Ink screens. And from this very article I discovered, "E Ink screens are easy on the eyes, glare free and generous on battery life -- the newest Kindle can last up to four weeks between charges." BTW ... I'm gonna tug at heart strings in November for a Mac Book Air! LOL! Good Post!!! I too wanted the KIndle for xmas for all the reasons you listed!!! I read an article comparing all and seeing I always wanted a kindle , it sold me even more!! I guess I will be getting it for myself since noone got it for me!!! !